Welcome to Hog Rush, LLC. Alabama's Top Tier Hog Eradication destination. In an effort to control Alabama's Feral Hog Population on Plantations and Farm lands, we have teamed up with Land Owners and Farmers to confront the over population problem. Trapping is the most cost efficient way of taking Hogs, however, our data concludes that Hogs are reluctant to explore a trap during the growing and harvest season. In this case, other methods must be employed to assist in Feral Hog Control. To offset the expense of Hog Control and equipment costs, we are now offering guided, Suppressed Weapon, Hog Eradication experiences. Each Guest is supplied with a Suppressed weapon Platform, topped with a High resolution Thermal Weapon sight. All Weapons are suppressed. Suppressors, commonly called "Silencers" reduce recoil, allow for better communication in the field, and reduce the chances of hearing loss. 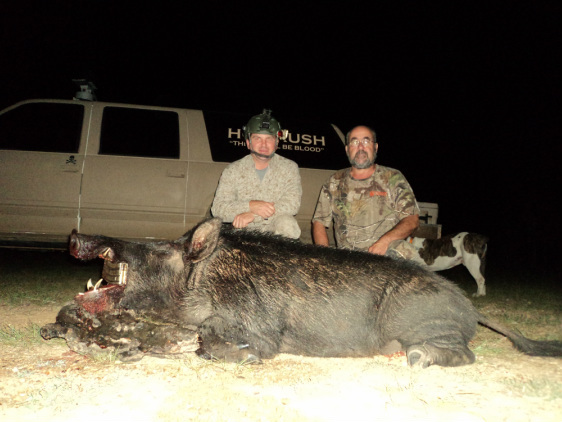 This type of Hog Eradication has been said to be one of the most exhilarating experiences. Guests are guided by experienced Hog Rush personnel who understand Hog behavior and the use of various weapon systems. We do not condone the use of sub sonic ammunition on Hog Eradication attempts. Although with a suppressor and using sub sonic ammunition, the gunshot will be close to nail gun quiet, the terminal ballistics resemble that of a pistol. To prevent unnecessary wounding, full power ammunition is used @ Hog Rush. This ensures a clean harvest of the animal and dignified kill. Our Suppressors muffle the gunshot to that of a .22lr. but maintain the terminal ballistics of the host firearm. All weapons and Suppressors are now built and supplied by HOG RUSH, a Licensed Firearm Manufacturer. Ask us about how you can own a suppressed rifle, now legal to hunt game animals with in Alabama. In Alabama, venturing out @ night with night vision in an effort to kill something requires a damage permit. Generally, these permits are issued to land owners, farmers, and/or Eradication professionals. Typically, permits are issued when crops are planted, as early as March. Hog Rush, LLC. carries a General Liability Insurance policy similar to that of most Hunting lodges. Be sure to check out our videos and pictures. Book your date today and join the effort to reduce the Feral hog Population. !